Faced with a ground-floor workspace glazed on three sides, Bureau de Change took the opportunity to create a scheme that looks stunning from the outside as well as in. When architecture practice Bureau de Change viewed its client's proposed new office space, the empty ground-floor site was of 'static character', prompting visions of something dramatic. Seeing glazing on three sides, Bureau de Change seized the opportunity to deliver a 'graphically robust' scheme that was visually compelling from both sides of the glass. And a bold statement is just what the client requested of the practice, briefed to establish a strong identity for the new HQ. In combining an events space and workplace, it was required to deliver a enthralling scheme while also offering the discretion of no physical signage or branding. 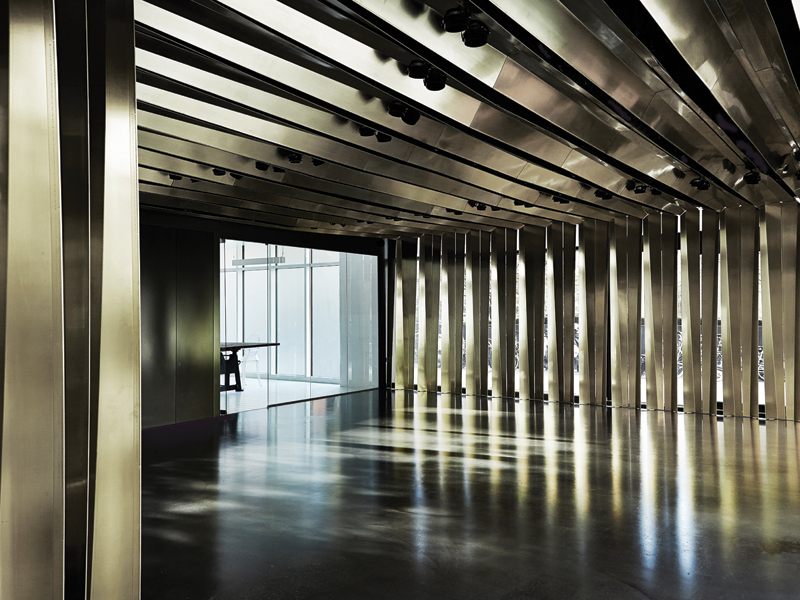 Filling the space with 332 bespoke brass panels -- termed 'ribbons' -- each casts shadows on to the polished floor, creating a dramatic reflection as they run along the walls and ceiling to arrive at a central elliptical 'chamber'. 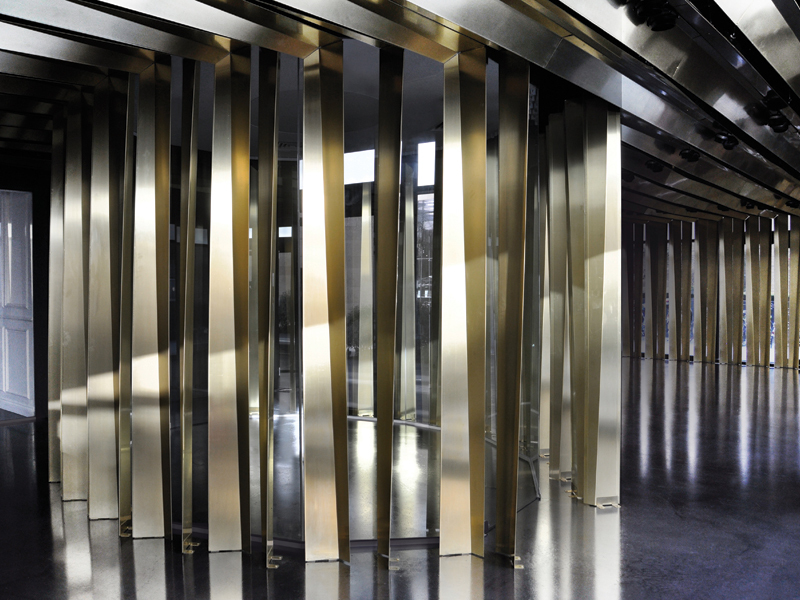 The walls of this space are formed by a cluster of twisted 1mm-thick brass ribbons and, in turn, lead to an intimate inner space in the expansive glass box. 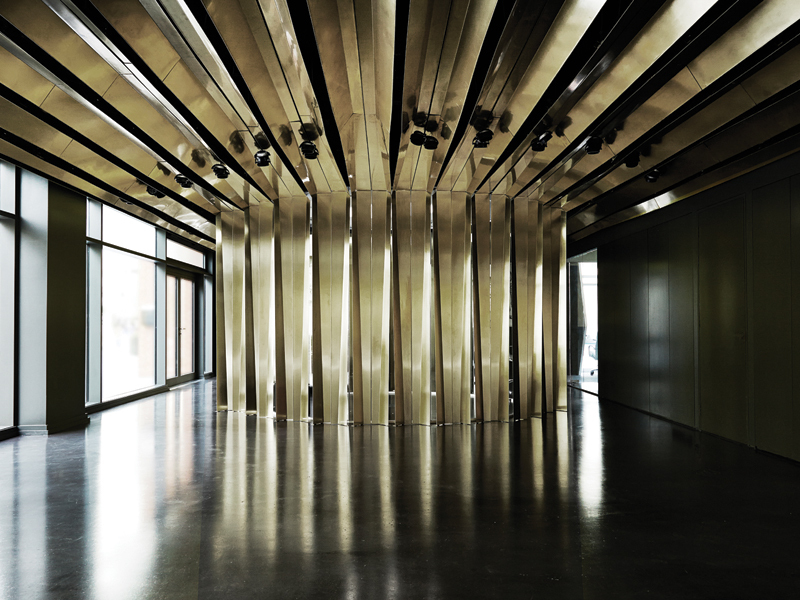 In addition to their aesthetic qualities the overhead brass strips also have a practical purpose: they swell and taper to circulate air, disperse light and mask off the existing service heavy ceiling. Connections in the ceiling surface follow a radial geometry, echoing the composition of the central core and creating a ripple effect from the 'heart' of the space. The design divides the site into two contrasting spaces: the sharp and reflective main office space, which will cater for events, and a warm monochrome back-office space, housing rooms for training and meetings. 'We distilled the scheme down to key materials to create contrasting atmospheres, each with their own kind of drama,' says Bureau de Change co-founder Katerina Dionysopoulou. With the office space taking on a contrasting modest palette 'the unexpected combination of materials and environments establishes a visual brand for the company housed here', she adds. 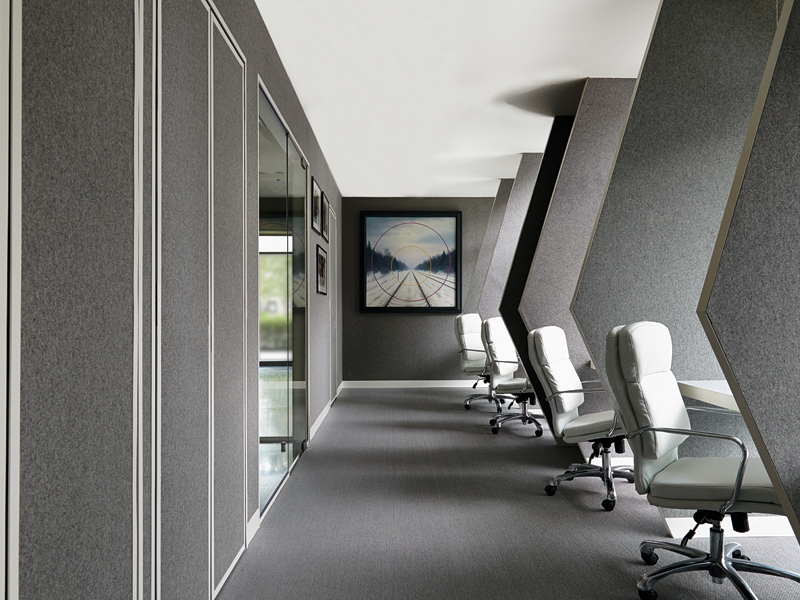 Utilitarian white tiling and grey felt wall panelling create a hushed atmosphere -- counterbalancing the liveliness of its dramatic brass space. 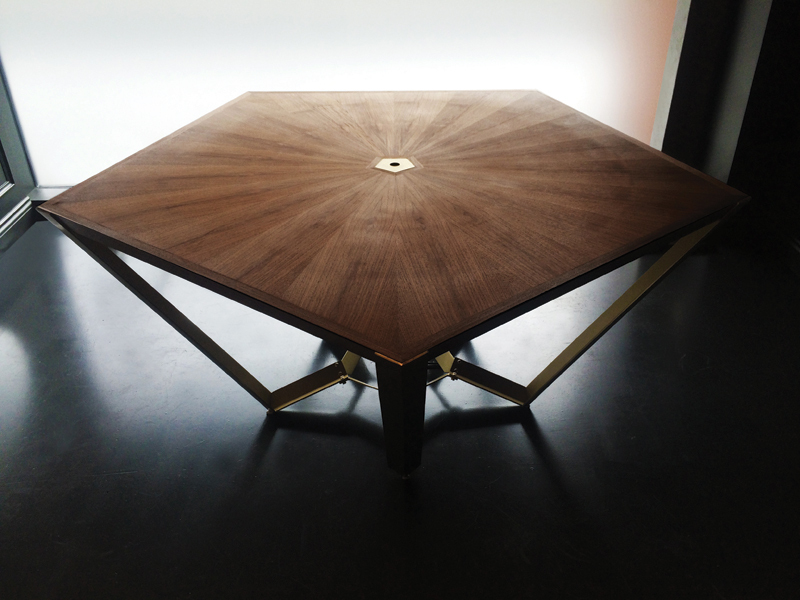 Bureau de Change was also asked to design a table to cater for intimate meetings, of up to five people. 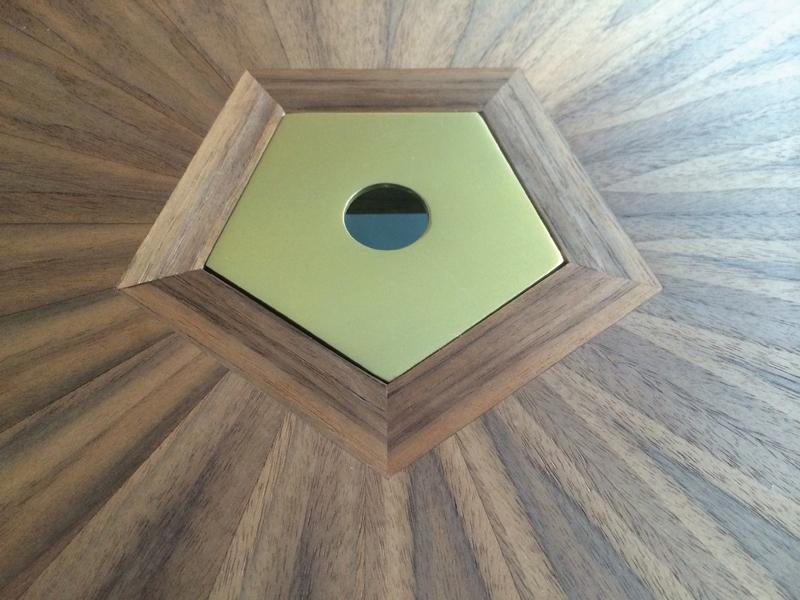 Constructed from 50mm-thick walnut veneer and a brass slab-like table top comprising 20 individual segments, it is book-matched and mirrored to create a radiating geometric pattern. 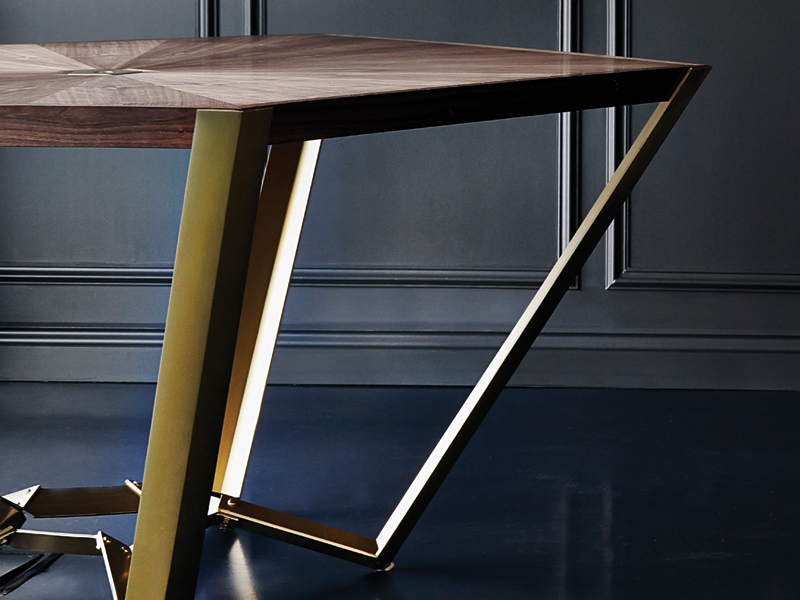 It appears to rest on fine 3mm-thick brass legs and reflects the visual language of the main office space of drama and elegance. Inclined legs add to the structural illusion -- as well as providing room for people to sit in comfort. More than 500 sq m of brass was used in the project's construction, fabricated by Mike Smith Studio and individually folded, edged and pressed. Bureau de Change likened it to pattern cutting, with such precision and risk with undertaking such a bold installation the small practice should be applauded for undertaking such challenges (and succeeding). Any errors could have been financially disastrous. Using full-size laser-cut floor maps, contractors were able to precisely place the structures and fix them with discreet fixings. 'To bring a visual punch to the main space, we set out to use a single material that would provide visual coherence,' says Mavropoulos. A team of white-gloved installers handled the brass pieces like precious artefacts.